Outdoor living is one of the hottest new trends in home design. More and more homebuyers are ranking outdoor living spaces as a top priority. And an increasing number of homeowners are installing these lovely outdoor spaces. Outdoor living spaces may include outdoor kitchens, fireplaces, or deluxe decks and patios. All of these spaces create extra living space for a home without having to invest in a full addition to the house. They also provide the luxury and relaxation of the outdoors in the balmy spring and summer months. But all of these spaces would be lacking without the proper lighting. 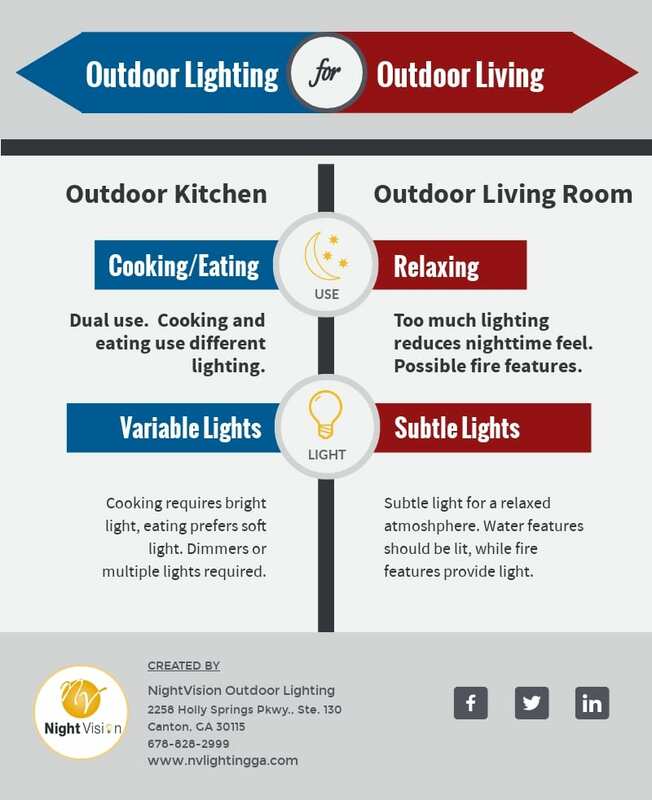 Just like you light your home so you can enjoy your living space at night, you need to make sure you have the right outdoor lighting for outdoor living. With outdoor living becoming a growing trend, the importance of outdoor lighting has also grown. It used to be that outdoor lighting was mostly ornamental. Lighting up the facade of your home allowed its beauty to carry on into the nighttime hours. Properly lighting your landscaping created new features not visible during the day. The interplay of shadow and light gave new life to an already beautifully kept garden. An additional benefit was the security that comes with lighting the area around your home. Home intruders have no interest in approaching a well lit home with nowhere to hide. All of these benefits were reason enough to invest in outdoor residential lighting. But outdoor lighting for living spaces was limited. Many homes had a simple porch light outside the front door. The light helped make it easier to see the entrance to the home. It was also a shorthand symbol to tell people that someone’s home. If a home had a long path to the front door, path lighting might also be installed to guide visitors and residents safely to the door. Patio or deck lighting, common in many homes, was closer to the modern concept of outdoor lighting for outdoor living. But in most cases the lighting was limited to a porch light or spot light shining out into the space. They gave some light in case you wanted to grill outdoors. But the limited lighting still wasn’t enough to really enjoy the space. Recently, with the growing interest in outdoor living, outdoor lighting has taken center stage. No longer is a simple patio or flood light sufficient. Homeowners are now thinking of their outdoor spaces like additional rooms in their home. They want to enjoy their spaces just like a living room or kitchen. So the lighting in these spaces needs to step up to the challenge. Today’s outdoor living spaces need lighting as complex and well designed as any room in your home. One very popular outdoor living space is the modern outdoor kitchen. Once upon a time, a simple charcoal or gas grill on the porch was considered a great way to barbecue. Today, homeowners want much, much more. An outdoor kitchen starts with a good grill, but greatly expands on that idea. 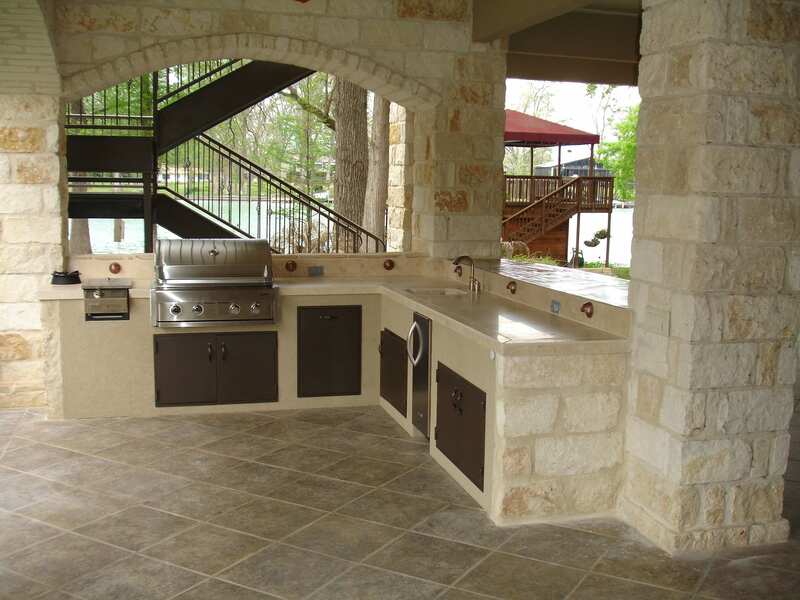 An outdoor kitchen may include a grill, a range, and even an oven. It will also have spaces to keep utensils and food while it is being prepared. In addition, an outdoor kitchen might have a refrigerator for cold beverages, and even a full bar for mixed drinks. If an outdoor kitchen is properly designed, the home chef should have no need to return to the indoor kitchen to complete their food prep. Instead, the outdoor kitchen is self contained. Of course, just like your indoor kitchen, an outdoor kitchen doesn’t close when the sun goes down. On the contrary, evenings and nights are prime time for home cooked meals with family and friends. But to make an outdoor kitchen usable into the nighttime hours, you will need the right kind of outdoor lighting. For outdoor kitchens, lighting needs to serve to functions. First, there needs to be lighting that is bright enough to prepare food. The light should make it easy to see your ingredients and your cooking, without having to strain the eyes. Second, once the meal is prepared, the lighting in an outdoor kitchen becomes mood lighting. Guests want to enjoy their meal outdoors without too much light ruining the al fresco experience. Soft light that isn’t too bright is prefered. To serve the two somewhat conflicting needs, often the best option is an adjustable lighting source. Lights that can be dimmed allow a chef to see while preparing food and guests to relax during their meal. For outdoor use, LED lights are ideal. They have a long life and low energy costs, requiring minimal maintenance. While not all LEDs are dimmable, there are dimmable LED lamps on the market. A professional outdoor lighting expert like those at Night Vision Outdoor Lighting will be able to help you pick the best lamps. In addition to being dimmable, color temperature is important for an outdoor kitchen. Typically, a whiter light with a higher temperature is useful for a kitchen. It allows a chef to better see the cooking food, with truer colors and a brighter feeling light. However, for dining rooms designers often suggest a soft white light. Soft white light is relaxing and easy on the eyes. For an outdoor kitchen that will serve both purposes, the designer and the homeowner will have to work together to come up with a personalized solution. Sometimes dimmable lights are sufficient. In other cases, separate lights with separate controls can make either type of light available for the right moment. Other outdoor spaces may act more like a living room or sitting room. Comfy outdoor furniture can provide a great way to relax on a warm Atlanta night. Once, a simple patio or deck would allow homeowners to relax outdoors. But recent trends have gone a step, or several steps, further. Modern outdoor leisure spaces can include a firepit or even a fully functional fireplace. In some designs, a fireplace may be accompanied by a water feature as well. Outdoor living rooms can be as luxurious as a homeowner’s budget and imagination allow. In these spaces, outdoor lighting can be much more subdued than in an outdoor kitchen. Family and friends need a little light to see by, but part of the appeal of the space is enjoying the night. Depending on the fire feature, a fire pit or fireplace can give some light. If there is a water feature, that feature needs to be lit up so it doesn’t disappear into the dark. In addition, subtle lighting in the 2700K or less range can bring a warm glow to the area. Lighting may be hidden under the ledge of a hardscape feature like a stone wall or planter. For any lighting, keeping it low and subtle is key. For many homeowners, adding an outdoor living space is no less involved than building on an addition to the home. Outdoor and landscape architects are commonly employed. The same is true of lighting. The outdoor lighting component of a living space needs to be professionally designed and installed. At Night Vision Outdoor Lighting, we have installed thousands of projects of all types. We are prepared to work with a homeowner, designer, or architect to design and install the perfect lighting for your project. You can contact us online or give us a call at 678-828-2999. We are happy to answer all your questions about outdoor lighting for outdoor living.